Why are people equating calls for the regulation of social media only with comments against the Administration? This is far from it. What was discussed at the Attorney-General’s Conference was the need to safeguard private individuals from defamation as well. For example, a teenager today gets drunk and is photographed doing something silly but ten years later she or he holds a respectable job, should that one silly incident be allowed to be posted online and ruin the young person’s future? How would you like this if this happened to your daughter? Sister? Best friend? Daily I have seen comments about individuals being made on social media and people are not taken to task and these individuals are not Government ministers or public persons, they are common people. Should they not be allowed to lead their lives with dignity? Stop politicising everything and you will see the other side of the coin as well. On a recent trip to Lautoka Market l passed through the adjoining bus station. Except for one bus, all others had their engines running and in the process spewing smoke and creating noise pollution. From my own experience l have noticed that things are very much enforced when new regulations and rules or laws are made but after some time the enforcement part slackens. Case in point: LTA is enforcing the new requirement regarding eTicketing that passengers must have their tickets on them or get fined a hefty $50. That is fine. But what about enforcing the law as clearly stated on the board at the bus station that bus engines must be switched off while waiting for passengers, that is, when the bus is parked. Can LTA or the city council enforcement units start looking into this? All of the good work Fiji as a nation is doing through Government in reducing greenhouse gas emissions through initiatives in renewable energy and the introduction of the 10 cents levy on the use of plastic bags to reduce pollution and gain control over or reduce climate change is greatly minimised or counteracted by the non enforcement of the law that buses must have their engines switched off when parked at the bus stations. Please relevant authorities – Do Your Jobs! If buses are the problem and the excuse is that they might not restart once the engine is switched off then that is not acceptable. With eTicketing in place l assume bus companies would be making greater profits as pilfering by drivers is reduced and all bus companies should have excellent buses as part of their fleets. Would it be asking too much to request or otherwise demand the ministry or minister responsible for the Land Transport Authoirty and municipalities to get this by-law enforced? It does not take a genius to calculate the tremendous amount of fuel that is wasted by buses with their engines left idling and the tremendous volume of harmful poisonous gases that are released as a result. And all this with would be passengers (that includes mothers with babies) sitting nearby on the benches at the bus stations and in the markets. Who dares say no that the health of individuals are not affected? Who dares say that this was not contributing to pollution or greenhouse gases and subsequent global warming. Why is this pollution allowed to take place? A small hole can sink a boat and this unchecked pollution by buses at bus stations in Fiji is not helping in making the targets with regards to acceptable temperature increase with regards to global warming, attainable. Everybody must play their part. The God-given resources which includes fossil fuels cannot be wasted as such. Global warming and adverse climate change are the reactions to abuse and mismanagement as such. We live in a nation that speaks volumes of the achievements made so far and I am proud to be a citizen of this beautiful nation in the South Pacific. With the festive season upon us, our pristine beaches around the nation would soon be swarming with people from all walks of life to relax, swim and enjoy the blissful atmosphere. I urge our people to be responsible and use nature’s gift with care. Let us not dump rubbish. 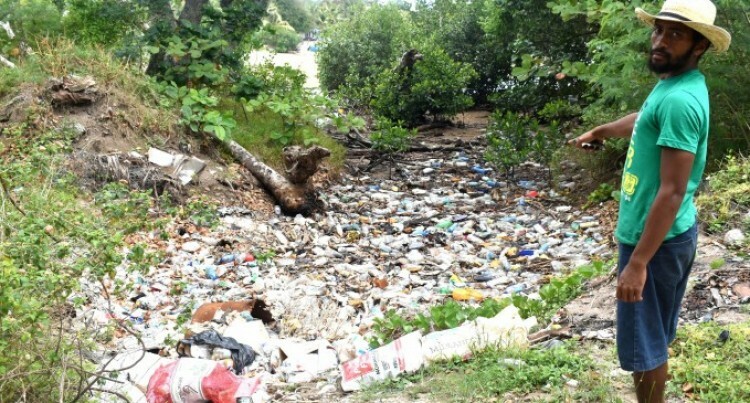 We must take initiatives to clean the area used to retain its charm and beauty. Let us not forget that the beauty of our fine sandy beaches attracts tourists across the globe at this time of year. Let them take the good tidings of our nation and spread the gospel back in their own countries. We must realise that dumping of rubbish is illegal and anyone found will be prosecuted. On this note, my suggestion to the concerned authorities is to deploy Police officers. Their presence around well-known beaches will not only prevent people from dumping rubbish but would also protect our people from crimes such as robbery with violence, drinking alcohol and harassing people and so on. And not forgetting for some, these areas are suitable places to consume illegal drugs. Police patrols should deter drug users and prevent the illegal dumping of rubbish in these areas. With the impact of climate change we must take care of our environment to prevent its degradation and at the same time prevent the spread of diseases. The long-term impact of throwing rubbish would result in harmful diseases like cancer, lung diseases, coronary disease and so on. One just has to read the research done by the World Health Organisation. Christmas is a season for giving, so we need to give back to nature by protecting it and looking after our beautiful beaches.